Promotional Line: "The most devastating detective story of the century! The basic plot line tells the story of how the two reporters from The Washington Post, Bob Woodward (Redford) and Carl Bernstein (Hoffman), found out about, and broke the Watergate story, resulting in the ultimate resignation of President Nixon. 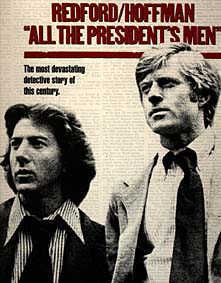 Director Alan J. Pakula's "All the President's Men" is a gripping true to life tale of investigative journalism. Pakula received a nomination for best directing.